Leveta Jo (Johnson) McConnell, 77, of Gore was born September 16, 1941 in Muskogee, OK to Everett and Nola (Hammonds) Johnson and peacefully passed away Wednesday, December 5, 2018 at her home with her family by her side. Leveta met, fell in love with and later married Charles McConnell on May 6, 1977 in Stigler, OK. A marriage that stood the test of time of 41 years. 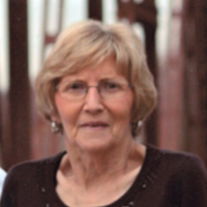 She was an avid sports fan and attended all of her grandchildren’s sporting events. She was a huge Thunder basketball and Atlanta Braves fan. At Christmas, she would sew Christmas stockings for all the grandchildren. She lived in the Gore area for the last 41 years. She was preceded in death by her parents; Everett and Nola Johnson; brothers, Clarence Johnson, Tom Johnson, JD Johnson and Elbert Johnson; sister, Pauline Goble; and grandson, Colton Andrews. Those left to cherish her memory; husband, Charles of the home; sons, Gary Andrews and wife Sherri of Webbers Falls, Bret Andrews of Gore, Tad Andrews and wife Becky of Broken Arrow; daughters, Melissa Sumpter and husband Steve of Gore, Gayla Johnson and husband Waylon of Sallisaw; grandsons, Jordan Andrews and wife Amanda of Webbers Falls, Logan Andrews and wife Kali of Muskogee, Dakota Andrews of Gore, Isaac and Seth Andrews of Broken Arrow, Steven Sumpter of Gore, Beau Johnson of Sallisaw; granddaughters, Chelsea Andrews of Gore, Hali Schmille and husband Spencer of Sallisaw and Taylor Johnson of Riverside, California; great grandchildren, Laiken Andrews, Stetson Andrews, Raylee Wiedel, Ava Andrews, Audrie Andrews, Ace Romine, Sawyer Schmille, Ty Sumpter and Tate Sumpter; brothers, R.L. Johnson and wife Carol and William Johnson; sisters, Owetta Goad and Carolyn Stricker; extended family and many friends. A memorial service to celebrate Leveta’s life will be held 11AM Monday, December 10, 2018 at Clifford D Garrett Family Funeral Home Chapel, Fort Gibson. A private family inurnment will be in the South Bethel Cemetery in Braggs, OK.